Hassidic Agudat Yisrael will oppose the current bill but Lithuanian Degel HaTorah and Shas are still undecided and rumors abound. There is potential for a split among Haredi Knesset factions over the Draft Law regarding conscription of young Haredi men to the military. The Council of Torah Sages that governs the Hassidic Agudat Yisrael faction instructed its Knesset members yesterday (Thursday) to oppose the bill in its current form. However, the Lithuanian-stream Degel HaTorah faction and Sephardic-Haredi Shas are still undecided regarding the bill, which was proposed by Defense Minister Avigdor Liberman. 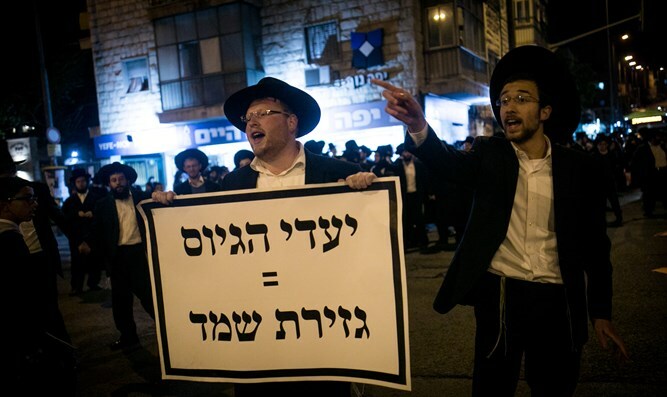 "As with every subject, the Torah Sages are the ones who will decide in the matter of the Enlistment Law, and as long as they have not made their pronouncement, there is no formal decision on the matter," said official sources in Degel HaTorah. They were responding to rumors according to which the Sages have accepted Liberman's bill. Shas, too, has been silent on the matter since yesterday. There have been reports that Shas Chairman Aryeh Deri thinks the bill is a "a relatively good" one that can be accepted without creating a coalition crisis. The Agudat Yisrael Council of Torah Sages instructed Deputy Ministers Yaakov Litzman and Meir Porush to exit the coalition if changes are not made to the bill.